ThinkTank Technology Personal Scale w/ LCD Digital Display, Tap-On Technology & Tempered Glass Platform. 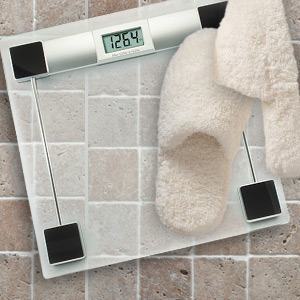 Step into a healthier you and watch yourself lose weight with this awesome LCD display scale. Measures up to 330 pounds. Part of any weight loss or fitness program should involve picking out an accurate scale to monitor results. The ThinkTank Technology Personal Scale has large digits displayed on a crisp LCD display that make tracking your progress a breeze. Weight readings lock and display for 5 seconds before the unit shuts off to conserve battery power.